The next time you find a lion chewing on your arm in the Kruger National Park don’t worry, because the feline immunodeficiency virus (FIV) it is probably infected with, is not transmittable to humans. Fortunately Tanya Kerr, part of a team investigating FIV in the park, did not have lions chewing on her. 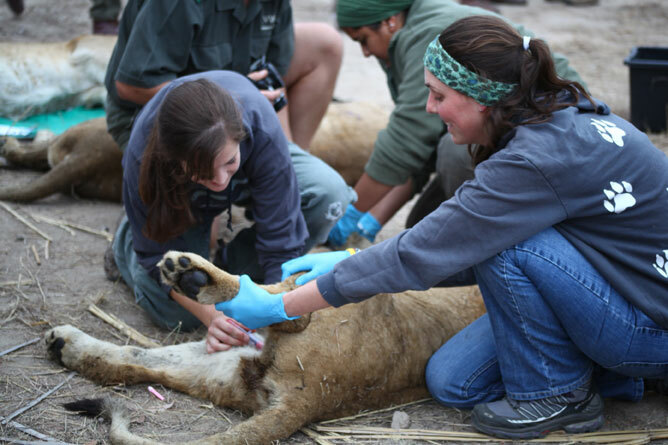 The Stellenbosch University student dealt with sedated lions as she assesses the spread of the various subtypes of FIV in the park. FIVPle – its proper name – is a unique marker in that, like the human immunodeficiency virus, it is host specific. As people living with HIV can cross-infect each other, so too can lions. The difference is FIV is transmitted between lions only through blood. While humans and domestic cats present with oral lesions caused by opportunistic infections, wasting, renal disease and chronic inflammation, the jury is still out on whether FIVPle causes clinical disease and if it is immuno depressant, said Danny Govender of SANParks’ scientific services. This is one of the questions the study aims to answer, as well as map the interaction between the prides in the park. “FIV is widespread in Kruger, but on its own, it is not an issue. Lions are not dying in large numbers. The numbers of lions in the park are healthy,” said Govender. “As far as disease goes we do have tuberculosis in lions – which comes at a cost. They are weakened and eventually die. But the question is, is there a link between TB and FIVPle,” said Govender. Right now though, Kerr has her work cut out for her in the university lab where she is trying to identify any new strains of FIVPle. The results can lead scientists closer to that Holy Grail of HIV/Aids research: a cure.